Why Should I Take My Dog To A Training Class? 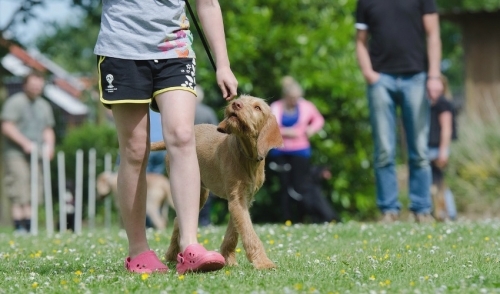 Share "Why Should I Take My Dog To A Training Class?" As a member of our family, we expect our dogs to be playful at times and docile at times, but always on their best behavior for guests. It is important to give your furry friend the chance to establish those behavior skills that will be a benefit for a lifetime. ●	Social Interaction: Dog training will provide the opportunity to develop interaction skills with other dogs, other people, and will groom your dog for how she or she should behave in new environments. Studies show that socialization is a key ingredient for the overall psychological well being of your dog. ●	Because Age Doesn’t Matter: Even an older dog will benefit from training. An old dog can still learn new tricks and new skills! ●	Good Manners: Picture your dog politely greeting guests, walking nicely on a leash, no longer chewing furniture, and obeying simple commands. What dog owner wouldn’t want these things? ●	It’s Great For You, Too: What better way is there to build a mutual bond and enhance your connection to your loved pup? Classes develop the owner skills needed to properly react to normal dog behaviors. More importantly, you will learn the skills to sustain a well-mannered canine through your leadership in the home and consistent reinforcement of good behaviors. Picture the easy walks through town, the hikes and the outdoor picnics that you will be able to peacefully enjoy with your well-trained, lovable companion. All thanks to your effort and a little time working together to benefit your dog!